Review: Does living on another planet with limited food and water appeal to you? Paradox is written by A.J. Paquette. It is not in a series and the main characters are Todd and Amy. This book will delight young readers who like adventure. 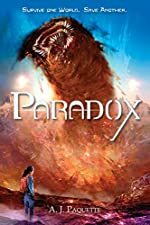 A group of colonists go to an extraterrestrial planet called Paradox many light years away. During this time, Amy, the main character, lost every bit of memory she had. Todd, her friend and she go out adventuring, since most of the remaining colonists died except for two other ones. They don't think there is any animal life on the planet, but it gets suspicious once the others fall in a trance. Something is going to happen, but nobody knows what. What I liked about this book is that it can leave you on pins and needles, and the reader will wonder what happens next. In my opinion, a person older than 10 may be more interested into a different type of adventure, and this book is a bit too simple for older children. The author also is a little too dramatic, but many little kids have a big imagination at one point. An example of the drama is "Still the measured drop is glorious. It echoes the thrum of her heart, the pounding in her ears. It's freefell." Many children younger than 10 would like this dramatized action. The book seems relatively short, and lots of younger children would prefer smaller books, while older children would prefer larger books. Something I did like about this story it its descriptive details about the environment; it illustrates how it might be. For instance, in page 122 it states, "Rolling purple blue sand dunes." Overall, the book was entertaining, but not suitable for readers over 10 years old. Review written by Danilo (6th grade student). We would like to thank Random House for providing a copy of Paradox for this review. Have you read Paradox? How would you rate it?